The obsolete geocentric model places Earth at the centre of the Universe. In science, a theory is superseded or becomes obsolete when a scientific consensus once widely accepted it, but current science considers it an inadequate, incomplete, or simply false description of reality. Such labels do not cover protoscientific or fringe science theories that have never had broad support within the scientific community. Furthermore, superseded or obsolete theories exclude theories that were never widely accepted by the scientific community. Some theories that were only supported under specific political authorities, such as Lysenkoism, may also be described as obsolete or superseded. All of Newtonian physics is so satisfactory for most purposes that it is more widely used except at velocities that are a significant fraction of the speed of light, and simpler Newtonian but not relativistic mechanics is usually taught in schools. Another case is the belief that the Earth is approximately flat. For centuries, people have known that a flat Earth model produces errors in long-distance calculations, but considering local-scale areas as flat for the purposes of mapping and surveying does not introduce significant errors. In some cases, a theory or idea is found baseless and is simply discarded. For example, the phlogiston theory was entirely replaced by the quite different concept of energy and related laws. In other cases an existing theory is replaced by a new theory that retains significant elements of the earlier theory; in these cases, the older theory is often still useful for many purposes, and may be more easily understood than the complete theory and lead to simpler calculations. An example of this is the use of Newtonian physics, which differs from the currently accepted relativistic physics by a factor that is negligibly small at velocities much lower than that of light. Scientific theories are testable and make falsifiable predictions. Thus, it is a mark of good science if a discipline has a growing list of superseded theories, and conversely, a lack of superseded theories can indicate problems in following the use of the scientific method. Spontaneous generation – a principle regarding the spontaneous generation of complex life from inanimate matter, which held that this process was a commonplace and everyday occurrence, as distinguished from univocal generation, or reproduction from parent(s). Falsified by an experiment by Louis Pasteur: where apparently spontaneous generation of microorganisms occurred, it did not happen on repeating the process without access to unfiltered air; on then opening the apparatus to the atmosphere, bacterial growth started. Transmutation of species, Lamarckism, inheritance of acquired characteristics – first theories of evolution. Not supported by experiment, and rendered obsolete by Darwinian evolution and Mendelian genetics, though some elements of Lamarckian evolution are coming back in the area of epigenetics. Vitalism – the theory that living things are alive because of some "vital force" independent of matter, as opposed to because of some appropriate assembly of matter. It was gradually discredited by the rise of organic chemistry, biochemistry, and molecular biology, fields that failed to discover any "vital force". Friedrich Wöhler's synthesis of urea from ammonium cyanate was only one step in a long road, not a great refutation. Preformationism – the theory that all organisms have existed since the beginning of life, and that gametes contain a miniature but complete preformed individual, in the case of humans, a homunculus. No support when microscopy became available. Rendered obsolete by cytology, discovery of DNA, and atomic theory. Telegony – the theory that an offspring can inherit characteristics from a previous mate of its mother's as well as its actual parents, often associated with racism. Scientific racism - the theory that humanity consists of physically discrete superior or inferior races. Rendered obsolete by Human evolutionary genetics and modern anthropology. Mendelian genetics, classical genetics, Boveri–Sutton chromosome theory – first genetic theories. Not invalidated as such, but subsumed into molecular genetics. Germ line theory, explained immunoglobulin diversity by proposing that each antibody was encoded in a separate germline gene. Caloric theory – the theory that a self-repelling fluid called "caloric" was the substance of heat. Rendered obsolete by the mechanical theory of heat. Classical elements – All matter was once thought composed of various combinations of classical elements (most famously air, earth, fire, and water). Antoine Lavoisier finally refuted this in his 1789 publication, Elements of Chemistry, which contained the first modern list of chemical elements. Point 2 of Dalton's Atomic Theory was rendered obsolete by discovery of isotopes, and point 3 by discovery of subatomic particles and nuclear reactions. Vitalism – See section on biology. Democritus, the originator of atomic theory, held that everything is composed of atoms that are indestructible. His claim that atoms are indestructible is not the reason it is superseded—as it was later scientists who identified the concept of atoms with particles, which later science showed are destructible. Democritus' theory is superseded because of his position that several kinds of atoms explain pure materials like water or iron, and characteristics that science now identifies with molecules rather than with indestructible primary particles. Democritus also held that between atoms, an empty space of a different nature than atoms allowed atoms to move. This view on space and matter persisted until Einstein described spacetime as being relative and connected to matter. John Dalton's model of the atom, which held that atoms are indivisible and indestructible (superseded by nuclear physics) and that all atoms of a given element are identical in mass (superseded by discovery of atomic isotopes). All of classical physics, including Newtonian physics, superseded by relativistic physics and quantum physics. However, classical physics is a limiting case of the latter two theories, and it is often a very good approximation. 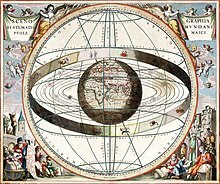 Heliocentric universe – made obsolete by discovery of the structure of the Milky Way and the red shift of most galaxies. Heliocentrism only applies to the selected Solar System, and only approximately, since the Sun's center is not at the Solar System's center of mass. Newtonian gravity – superseded by general relativity, to which it is a good approximation unless typical speeds approach that of light in a vacuum (c). The anomalous perihelion precession of Mercury was the first observational evidence that Newtonian gravity was not totally accurate. Drainage divides as always being made up by hills and mountains. Cryptoexplosion craters, now discarded in favour of impact craters and ordinary volcanism. Pure behaviorist explanations for language acquisition in infancy, falsified by the study of cognitive adaptations for language. Psychomotor patterning, a pseudoscientific approach to the treatment of intellectual disabilities, brain injury, learning disabilities, and other cognitive diseases. Heroic medicine – a therapeutic method derived from the belief in bodily humour imbalances as the cause of ailments. Miasma theory of disease – the theory that diseases are caused by "bad air". No experimental support, and rendered obsolete by the germ theory of disease. Phrenology – a theory of highly localised brain function popular in 19th century medicine. Here are theories that are no longer considered the most complete representation of reality, but remain useful in particular domains or under certain conditions. For some theories a more complete model is known, but in practical use the coarser approximation provides good results with much less calculation. Newtonian mechanics was extended by the theory of relativity and by quantum mechanics. Relativistic corrections to Newtonian mechanics are immeasurably small at velocities not approaching the speed of light, and quantum corrections are usually negligible at atomic or larger scales; Newtonian mechanics is totally satisfactory in engineering and physics under most circumstances. Classical electrodynamics is a very close approximation to quantum electrodynamics except at very small scales and low field strengths. The formula known as Newton's sine-square law of air resistance for the force of a fluid on a body, though not actually formulated by Newton but by others using a method of calculation used by Newton, has been found incorrect and not useful except for high-speed hypersonic flow. The once popular Cycle of erosion is now considered one of many possibilities for landscape evolution. The theory of continental drift was incorporated into and improved upon by plate tectonics. ^ Popper, Karl (1963), Conjectures and Refutations, Routledge and Kegan Paul, London, UK. Reprinted in Theodore Schick (ed., 2000), Readings in the Philosophy of Science, Mayfield Publishing Company, Mountain View, Calif.
^ "germline theory". Glossary. NCBI. ^ Lefers, Mark. "germ-line theory". Glossary. Northwestern University. Retrieved 28 February 2012. ^ De Leon, Professor N. "Dalton's Atomic Theory". Chemistry 101 Class Notes. Indiana University Northwest. Retrieved 26 August 2013. ^ Cathcart, Michael (2009). The Water Dreamers: How Water and Silence Shaped Australia. Melbourne: Text Publishing. chapter 7. ISBN 9781921520648. ^ Crain, Stephen and Diane C. Lillo-Martin (1999). An Introduction to Linguistic Theory and Language Acquisition. Oxford: Blackwell. ^ Steven Novella, MD. "Psychomotor Patterning". Retrieved October 16, 2014. ^ Aerodynamics: Selected Topics in the Light of Their Historical Development,book by Theodore Von Karman, 1954, Dover Publications, p10 and following pages Detailed discussion of Newton's sine-square law, invalidity in the general case and applicability at high supersonic speeds. ^ Orme, Anthony R. (2007). "The Rise and Fall of the Davisian Cycle of Erosion: Prelude, Fugue, Coda, and Sequel". Physical Geography. 28 (6): 474–506. doi:10.2747/0272-3646.28.6.474.